This article explains the responsive design capabilities RadMenu offers. 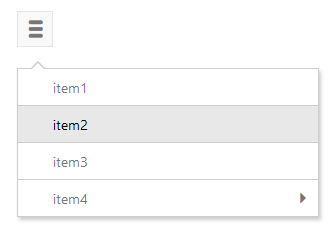 The Lightweight RenderMode of RadMenu supports elastic design since Q1 2014. RadMenu in Lightweight RenderMode supports changing the font size without breaking the control's appearance - if the new size is larger than the original, the elements in the control will simply increase their size as well to accommodate the text. This fluid layout is achieved by using em units for setting dimensions and paddings in the control, instead of px because em units are tied to the font size. This allows dimensions and sizes to scale with the font size. The following sample shows how to increase the font size of a RadMenu and the effect can be seen in comparison in Figure 1. Multiple menus on the same page. More information about the functionalities that the RadMenu mobile render mode offers you can find here.